Albrecht Dürer (May 21, 1471 – April 6, 1528) was a German painter and mathematician who is considered one of the greatest creators of old master prints. He often executed his works in series, including the Apocalypse (1498) and his two series on the passion of Christ, the Great Passion (1498–1510) and the Little Passion (1510–1511). Dürer's best known individual engravings include Knight, Death, and the Devil (1513), Saint Jerome in his Study (1514) and Melencolia I (1514). His most iconic images are his woodcuts of the Four Horsemen of the Apocalypse (1497–1498) from the Apocalypse series, and the "Rhinoceros." Additionally, he painted a number of religious works and self portraits in oil and created many brilliant watercolors and drawings, which now through modern reproductions are perhaps his best known works. Until the end of the fifteenth century late medieval realism in the north and the art of the Renaissance in Italy developed more or less independently of each other. Albrecht Dürer was, in effect, the first non-Italian artist to associate the humanistic disciplines with the esthetic pursuits of art. He has been conventionally regarded as the greatest artist of the Renaissance in Northern Europe. Dürer's career came at the beginning of the Reformation, which he supported, and many of his subjects are religious. His work reflects the apocalyptic spirit of his time, when famine, plague, and social and religious upheaval were common. 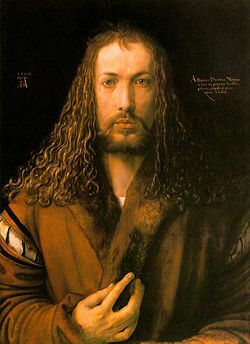 Dürer was born on May 21, 1471, third child and second son of Albrecht Durer, Sr. and Barbara Holper who came from a prosperous Nuremberg family. They had between 14 and 18 children. His father was a successful goldsmith, who in 1455 had moved to Nuremberg from Ajtós, near Gyula in Hungary. After a few years of school, Dürer started to learn the basics of goldsmithing and drawing from his father. Though his father wanted him to continue his training as a goldsmith, he showed early talent in drawing and subsequently, served as an apprentice to Michael Wolgemut, the leading producer of altarpieces, at the age of fifteen. A superb self-portrait, a drawing in silverpoint, is dated 1484 (Albertina, Vienna,) and is inscribed “when I was a child.” Wolgemut, a leading artist in Nuremberg at the time and owner of a large salon, produced a variety of works of art, in particular woodcuts for books. 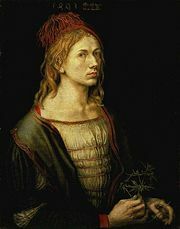 Dürer married Agnes Frey on July 7, 1494, the daughter of Hans Frey, who had made quite a lot of money through making jewelry, musical instruments, and mechanical devices. The marriage helped raise Dürer's status in Nürnberg, as well as provided him with money that enabled him to set up his own studio. In 1494, he left Germany to study the art of Italy. He returned to Nuremberg in 1495, opened his own studio, and over the next five years developed his style, which increasingly integrated Italian influences with Northern forms. His best works in the early years were his woodcut prints, which were mostly religious, but included some secular scenes such as, The Mens Bath-house (c. 1496). These were larger than the great majority of German woodcuts created up until this time and were far more complex and balanced in composition. It is now thought highly unlikely that Dürer would have cut any of the woodblocks himself; instead this task would have been left to a craftsman. His training in Wolgemut's studio, which included creating many carved and painted altarpieces, evidently gave him experience in this technique and its potential. Dürer either drew his design directly onto the woodblock itself, or glued a paper drawing to the block. Either way his original drawings were destroyed during the cutting of the block. His famous series of sixteen great designs for the Apocalypse are dated 1498. He made the first seven scenes of the Great Passion in the same year, and a little later, a series of eleven of the Holy Family and the Saints. Around 1503–1505 he produced the first seventeen of a set illustrating the life of the Virgin, which he did not finish for some years. Neither these, nor the Great Passion, were published as sets until several years later, however, prints were sold individually in considerable numbers. During the same period Dürer trained himself in the difficult art of using the burin to make engravings. The first few were relatively unambitious, but by 1496 he produced the masterpiece, the Prodigal Son. He was soon producing some spectacular images, notably, Nemesis (1502), The Sea Monster (1498), and Saint Eustace (1501), which has a highly detailed landscape background and beautiful animals. He made a number of Madonnas, single religious figures, and small scenes with comic peasant figures. These prints, which were highly portable, made Dürer famous throughout the main artistic centers of Europe within a short period of time. In his altarpieces Dürer revealed his interest in perspective, as in the Paumgartner Altarpiece (1502-1504). His portraits, such as Oswolt Krell (1499), were characterized by sharp psychological insight. Dürer depicted mythological and allegorical subjects in his metal engravings, for example, the Dream of the Doctor (after 1497) and Sea Monster. He also used this technique for one of his most popular prints, the Prodigal Son. Dürer represented the hero in a novel way, the scene chosen being neither the prodigal son's sinful life nor the happy ending of his return to his father, but the moment in which the hero becomes cognizant of his sinful life and begins his repentance. In the print Nemesis (1501-1502) Dürer's study of human proportion is manifested, together with his taste for complicated humanistic allegory, which appears in several of his prints of that period. The Venetian artist Jacopo de' Barbari, whom Dürer had met in Venice, visited Nuremberg in 1500, and Dürer is said to have learned much about the new developments in perspective, anatomy, and proportion from him. His study of these elements would become a lifelong preoccupation. A series of extant drawings show Dürer's experiments in human proportion, leading to the famous engraving of, Adam and Eve (1504). This is the only existing engraving signed with his full name. Albrecht Dürer was, in effect, the first non-Italian artist to associate the humanistic disciplines with the esthetic pursuits of art. Dürer made large numbers of preparatory drawings, especially for his paintings and engravings, many of which have survived. One of the most well known is the Praying Hands (1508 Albertina, Vienna). He also continued to make images in watercolor and bodycolor. An exquisite still life of a meadow is his "Hare" (1502, Albertina, Vienna). These are often considered to be the first pure landscape studies known in Western art. Dürer made a second trip to Italy in 1505, staying in Venice for nearly two years. In Italy, he returned to painting, at first producing them on linen. These include portraits and altarpieces, notably, the Paumgartner altarpiece and the Adoration of the Magi. By this time Dürer's engravings had attained great popularity and were being copied. In Venice he was given a valuable commission from the emigrant German community for the church of St. Bartholomew. The picture painted by Dürer was closer to the Italian style—the Adoration of the Virgin, also known as the Feast of Rose Garlands. It was subsequently acquired by the Emperor Rudolf II and taken to Prague. Other paintings Dürer produced in Venice include, The Virgin and Child with the Goldfinch, Christ disputing with the Doctors (supposedly produced in a mere five days), and a number of smaller works. When he visited Bologna he met with Luca Pacioli whom he believed held the mathematical secrets of art. He also visited Jacopo de Barbari and the great efforts which Dürer made to meet de Barbari shows the importance which Dürer more and more attached to mathematical knowledge. Dürer returned to Nürnberg from this second visit to Italy feeling that he must delve yet more deeply into the study of mathematics. Despite his popularity with the Venetians, Dürer was back in Nuremberg by mid-1507 where he remained until 1520. His reputation had spread throughout Europe and he communicated with most of the major artists of the time even exchanging drawings with Raphael. The years between his return from Venice and his journey to the Netherlands are divided according to the type of work he did. The first five years, 1507–1511, are pre-eminently the painting years of his life. He worked with a vast number of preliminary drawings and studies and produced what have been called his four greatest works in painting, Adam and Eve (1507), Virgin with the Iris (1508), the altarpiece the Assumption of the Virgin (1509), and the Adoration of the Trinity by all the Saints (1511). During this period he also completed the two woodcut series, the Great Passion and the Life of the Virgin, both published in 1511. However, Durer complained that painting did not make enough money to justify the time it required, so from 1511 to 1514 he concentrated on printmaking and engraving. The major works he produced in this period were the 37 woodcut subjects of the Little Passion, published first in 1511, and a set of 15 small engravings of the same theme in 1512. In 1513 and 1514 he created his three most famous engravings, The Knight, Death, and the Devil (or simply, The Knight, as he called it), the enigmatic and much analyzed Melencolia I, and St. Jerome in his Study (both 1514). In Melencolia I there appears a fourth-order magic square (a set of integers (often 1, 2, … , n2 ) arranged in a square in such away that each row, each column, and often the two diagonals as well, sum to the same number), which is believed to be the first seen in European art. The two numbers in the middle of the bottom row give the date of the engraving as 1514. 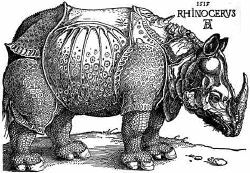 In 1515, he created a woodcut of a Rhinoceros from a written description and brief sketch, without ever seeing the animal depicted. Despite being relatively inaccurate (the animal belonged to a now extinct Indian species), the image has such force that it remains one of his best-known, and was still being used in some German school science text-books up until the early 19th century. In the years leading to 1520 he produced a wide range of works, including portraits in tempera on linen in 1516, engravings on many subjects, a few experiments in etching on plates of iron, and parts of the Triumphal Arch and the Triumphs of Maximilian which were projects directly commissioned by Maximilian I, Holy Roman Emperor. He drew marginal decorations for some pages of an edition of the Emperor's printed prayer book. These were quite unknown until facsimiles were published in 1808 - the first book ever published in lithography. The decorations show a lighter, more fanciful, side to Dürer's art, as well as, his usual superb draftsmanship. He also drew a portrait of the Emperor Maximilian, shortly before his death, in 1519. In the summer of 1520 Dürer made his fourth, and last journey. He sought to secure new patronage following the death of Maximilian, and to avoid an outbreak of sickness in Nuremberg. He, his wife, and her maid set out in July for the Netherlands in order to attend the coronation of the new emperor, Charles V. He journeyed by the Rhine to Cologne, and then to Antwerp, where he was well received and produced numerous drawings in silverpoint, chalk, and charcoal. Besides going to Aachen for the coronation, he made excursions to Cologne, Brussels, Bruges, Ghent, and Zeeland. In Brussels he saw "the things which have been sent to the king from the golden land"—the Aztec treasure that Hernán Cortés had sent home to Holy Roman Emperor Charles V following the fall of Mexico. Dürer wrote that this treasure trove "was much more beautiful to me than miracles." Dürer appears to have been adding to his own collection, and he sent back to Nuremberg various animal horns, a piece of coral, some large fish fins, and a wooden weapon from the East Indies. He took a large stock of prints with him, and recorded in his diary to whom he gave, exchanged, or sold them, and for how much. This gives rare information on the monetary value placed on old master prints at the time. Unlike paintings, their sale was very rarely documented. He finally returned home in July 1521, having caught an undetermined illness which afflicted him for the rest of his life, and greatly reduced his rate of work. Back in Nuremberg, Dürer began work on a series of religious pictures. Although many preliminary sketches and studies survive, no paintings on a grand scale were completed during this time period. This was due in part to his declining health, but even more so because of the time he invested in the preparation of his theoretical works on geometry and perspective, the proportions of men and horses, and fortification. The consequence of this shift in emphasis was that during the last years of his life, Dürer produced comparatively little as an artist. His only painted works were a portrait of Hieronymus Holtzschuher, a Madonna and Child (1526), a Salvator Mundi (1526), and two panels showing Saint John with Saint Peter in front and Saint Paul with Saint Mark in the background. In engraving, Dürer produced only a few portraits, those of the cardinal-elector of Mainz (The Great Cardinal), Frederick the Wise, elector of Saxony, and his humanist friends Willibald Pirckheimer, Philipp Melanchthon, and Erasmus of Rotterdam. Durer, who derived great satisfaction from his friendship and correspondence with Erasmus and other scholars, produced two books during his lifetime. One, on geometry and perspective, The Painter's Manual (more literally, the Instructions on Measurement) was published at Nuremberg in 1525. It is regarded as the first book for adults to be published on mathematics in German. His work on fortification was published in 1527, and his work on human proportion was published in four volumes posthumously. Dürer died in 1528, in Nuremberg at the age of 56. His large house (which he bought in 1509 from the heirs of the astronomer Bernhard Walther), where his studio was located, and where his widow lived until her death in 1537, remains a prominent Nuremberg landmark and a museum. I pray Your Honor to convey my humble gratitude to His Electoral grace, and beg him humbly that he will protect the praiseworthy Dr. Martin Luther for the sake of Christian truth. It matters more than all the riches and power of this world, for with time everything passes away; only the truth is eternal. And if God helps me to come to Dr. Martin Luther, then I will carefully draw his portrait and engrave it in copper for a lasting remembrance of this Christian man who has helped me out of great distress. And I beg your worthiness to send me as my payment anything new that Dr. Martin may write in German. Unknown to Dürer at the time, Luther was very much alive and had been placed in hiding by his friends to protect him from capture by the imperial or papal forces. Dürer exerted a huge influence on the artists of succeeding generations; especially on printmaking, the medium through which his contemporaries largely experienced his art, as his paintings were mostly held in private collections located in relatively few cities. His success in spreading his reputation across Europe through prints was undoubtedly an inspiration for major artists such as Raphael, Titian, and Parmigianino, who also entered into collaboration with printmakers in order to distribute their work beyond their local regions. The generation of Italian engravers who trained in the shadow of Dürer all either directly copied parts of his landscape backgrounds (Giulio Campagnola and Christofano Robetta), or whole prints (Marcantonio Raimondi and Agostino Veneziano). However, Dürer's influence became less dominant after 1515, when Marcantonio perfected his new engraving style, which in turn, traveled over the Alps to dominate Northern engraving also. Durer has never fallen from critical favor, and there have been revivals of interest in his works in Germany particularly during the Dürer Renaissance (1570–1630), in the early nineteenth century, and during the period of German Nationalism from 1870–1945. In 1509 Dürer had bought the house previously owned by the mathematician-astronomer Bernhard Walther (now the Dürerhaus Museum), which still contained both its observatory and scientific library. His house, tomb, and the bronze portrait statue of Dürer by Christian Daniel Rauch (1777–1857) erected in 1840, the first such public monument to honor an artist, can still be seen in Nuremberg. He is commemorated on the Lutheran Calendar of Saints, with other artists, on April 6. The crater Dürer on Mercury was named in his honor. St. Jerome in the wilderness. ↑ 1.0 1.1 1.2 1.3 1.4 1.5 1.6 1.7 1.8 1.9 Giulia Bartrum, Albrecht Durer and his Legacy: The Graphic Work of a Renaissance Artist (Princeton, NJ: Princeton University Press, 2003, ISBN 0691114935). ↑ Raymond L. Lee, and Alistair B. Fraser, The Rainbow Bridge (Penn State Press, 2001, ISBN 0271019778). ↑ Albrecht Durer Answers.com. Retrieved November 20, 2007. ↑ Albrecht Durer School of Mathematics and Statistics, University of St Andrews, Scotland. Retrieved November 20, 2007. ↑ Peter O. Mueller, Substantiv-Derivation in Den Schriften Albrecht Durers (Walter de Gruyter, 1993, ISBN 3110128152). ↑ Albrecht Dürer, Reformation Media Man Gospel.com. Retrieved November 20, 2007. ↑ Steve Ozment, A Mighty Fortress: a new history of the German people, 100 B.C.E. to the 21st century (London: Granta, 2005), 77. Albrecht Durer A World History of Art. 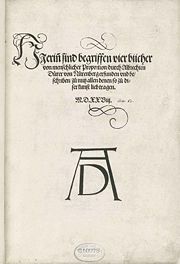 Albrecht Dürer: Vier Bücher von menschlicher Proportion (Nuremberg, 1528). Works by Albrecht Dürer. Project Gutenberg. De Symmetria... and Underweysung der Messung 1538, from Rare Book Room. John J. O'Connor and Edmund F. Robertson. Albrecht Durer at the MacTutor archive. This page was last modified on 18 February 2019, at 21:01.